Ellora Temples, hewn out of rock outside Aurangabad in Maharashtra, were built between the 5th and the 10 century AD. They are a World Heritage site. 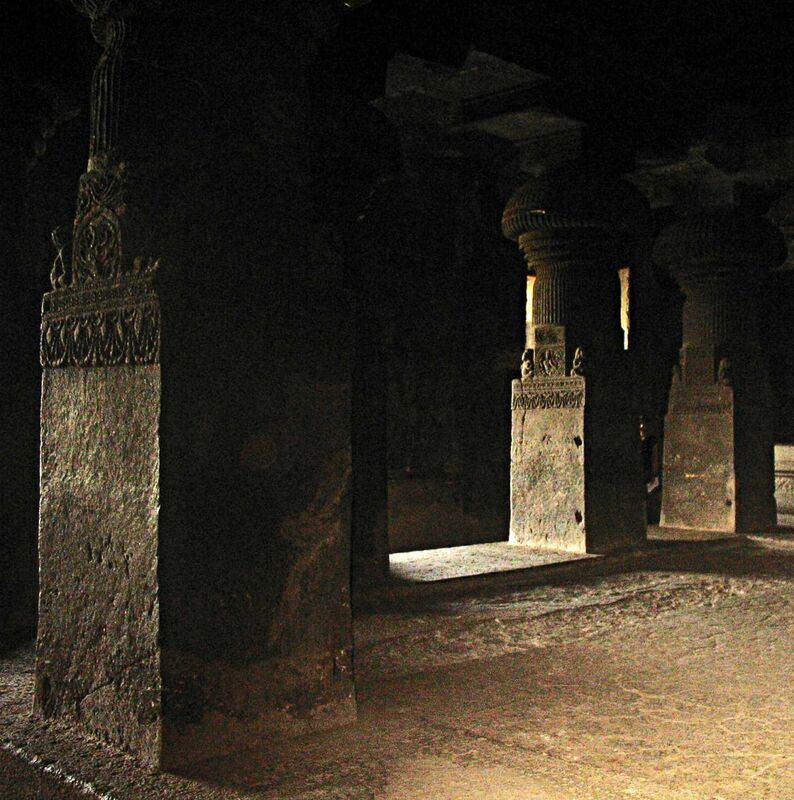 Ellora has 12 Buddhist, 17 Hindu and 5 Jain caves/temples. 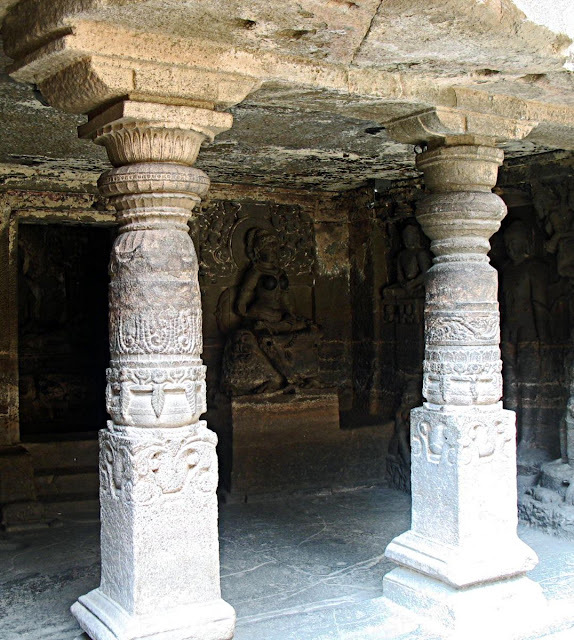 Here are some photographs of the carved and intricately designed sculpted pillars of some of the temples. These pillars were at one time painted and one can see the remnants of the paint on the pillar. It has a round shape at the top and broadens out into a rectangular shape at the bottom. 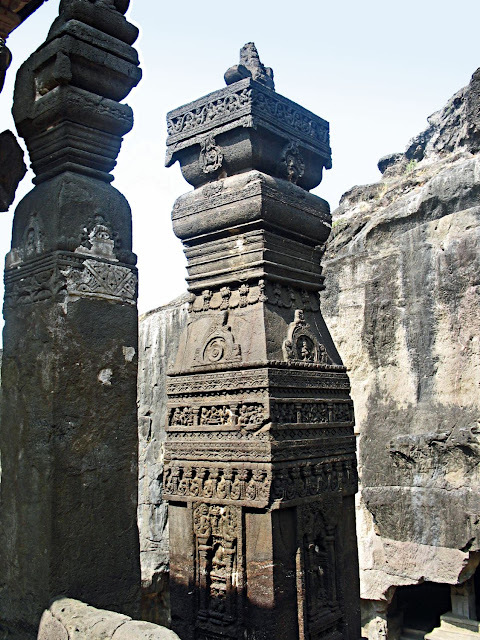 Here you can see the floral motifs on the pillars. There are long leaves falling down from the small flowers. Above that there is a design of some small figures enclosed by a beaded semi-circle. The top of the pillars the designs are larger in size. The next three photographs show the pillars from Kailashnath Temple at Ellora, the most magnificent temple of all the Ellora temples. 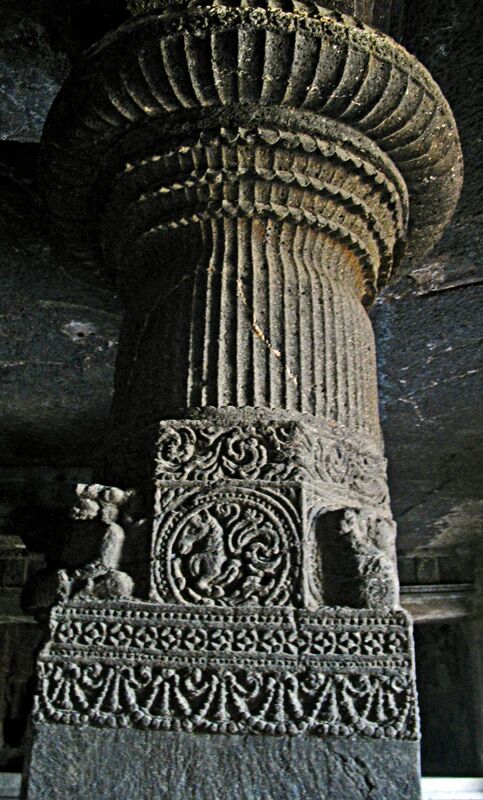 Here is a close-up of the pillar design. 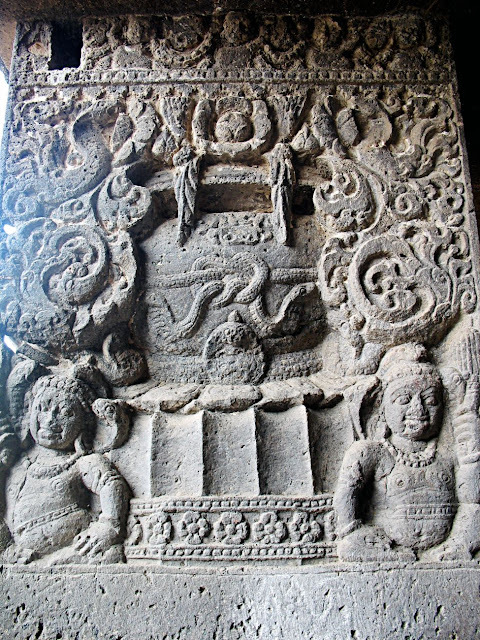 Figures of people in various poses, dancing figures and geometric designs can be seen. 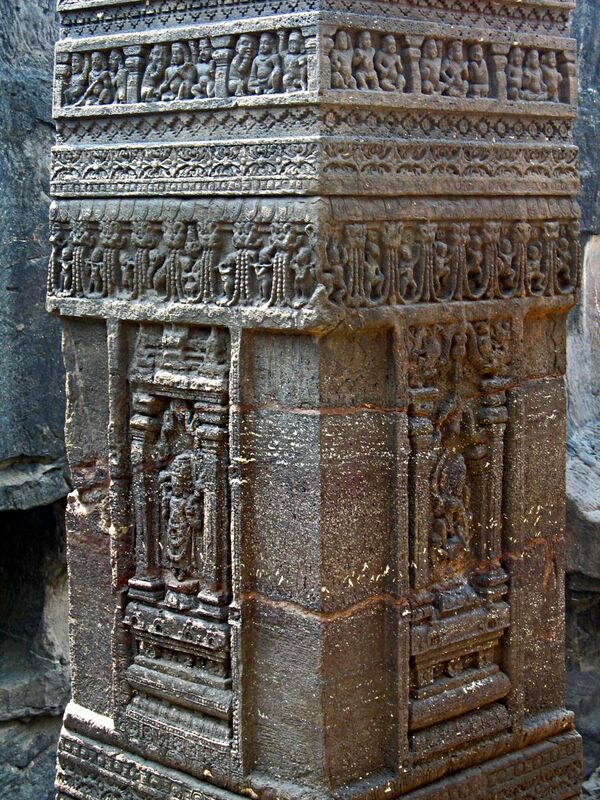 This is a base of a large column at Kailashnath temple showing elaborate carvings with gods and goddesses as well as other motifs. 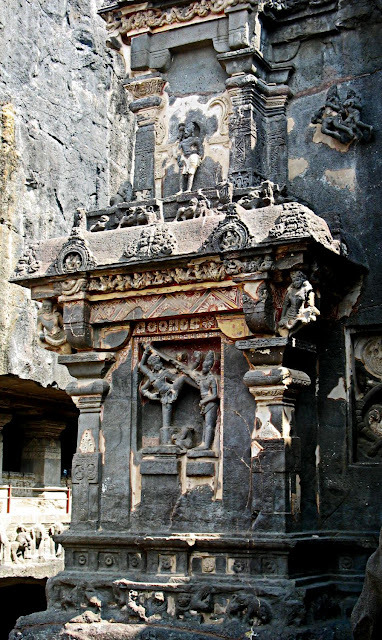 More images from Ellora: Kailashnath Temple at Ellora - Photos or Ellora Temples sculpted exteriors or for images of Ajanta Art and Ajanta Temples try the label "Ajanta" or "Ellora" to find images from each of these places, including designs and sculptures.